... So I found this old spamusement on my server. The "last modified" date indicates it's from April 2010. I have no memory of drawing it, and as far as I can tell, I never uploaded it. Strange, huh? I think you were taking some serious Physics classes or something at the time? Welcome back-ish, please stick around! 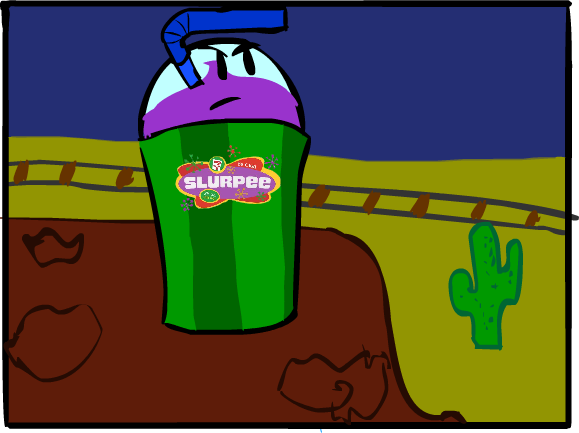 I love the vision of the proud Slurpee surveying his domain. PonderThis wrote: I love the vision of the proud Slurpee surveying his domain. Staking his claims near the tracks. Judas Maccabeus wrote: Give a man a fire and he's warm for a day. Set a man on fire and he's warm for the rest of his life. If he wouldn't get fired, he'd say, "I'm the king of all Icee." Being fired is bad for something meant to remain frozen.